Today dawned clear with a forecast of temperatures in the 80's and low humidity. 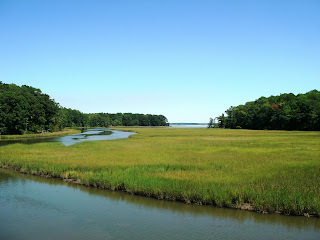 The Colonial Parkway heads southeast from Williamsburg on the old road to Yorktown. Tall trees bordered the road until we crossed King's creek heading out to the York River. We could smell the saltwater and soon came across beautiful white sand beaches along the river. 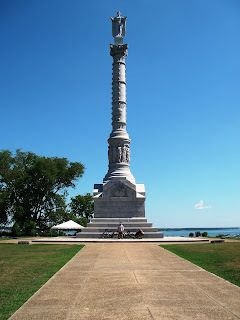 We soon reached Yorktown and the victory monument. It is huge and has large inscriptions on each side. We really outnumbered the British at Yorktown and it was the culmination of the seven years of the Revolutionary War. We had 5500 Continental army troops, 7000 French troops, and 3000 militiamen. The British had 7250 troops and were cut off from supplies and retreat on the York River by a blockade of French ships. The British held out in a siege for 19 days before surrendering. We have now finished our coast to coast bike ride and are working up some interesting trip statistics to share. We look forward to continue sharing our adventures with y'all (oh my gosh, how long have we been in the South?) as we make our way back home. How the heck ARE you getting home? This is the last town, right? Heartfelt, huge congratulations! What an awesome endeavor. Although it is quite tiny in comparison, I just completed the biggest single-day physical accomplishment of my life--I made it to the summit of Mt Shasta! 8 hours to the top, and 3 1/2 hours down. It would not have been possible without Crossfit. Looking forward to seeing you in person. Ah YES! Congrats to the gang of three. Was there some mention of a new Prius? Congratulations! Did you dip your feet in the Atlantic? Superguys (and a very brave and patient dog)!! Awesomeness!! We are all out of superlatives and quickly using up the exclamation points!!! We're pining to catch a whiff of the salt breeze here in Prairie Cafe, MIddleton, WI. May you enjoy wearing your laurels. Stay in touch. Well Mark, topping Mt. Shasta is quite an accomplishment! Hurray for you! We have been up on the north flank of Mt. Shasta, but not to the top, so we have an idea of what is involved and it's no mean feat! We are driving home, after a visit with my cousin Bob in Amherst, Mass. Originally we were going to ride up there, but we sort of ran out of energy for another 800+ miles. Anyway, coast to coast feels good! But for now we are looking forward to returning home, and of course, getting together with you. Thanks Bill! By the way we really liked your song. We feel lucky to have made friends like you and Anne all across the country. Belinda is making new plans for another visit to Virginia. So see you then, unless you come out west first. Alright John, thanks. Yes you heard Prius. We were lucky to get it. In California they seem to be generally available lately. We thought it would be the same here. But it isn't. There is a 2 to 3 month waiting list. But.. the day before we showed up someone backed out of a deal, so the car was sitting there waiting for us. It was even the color Belinda most wanted! We had been thinking that we would rent something to drive home, but one way rentals have become much more expensive than in the past with all kinds of restrictions. We had been planning on buying a gas saver car when we got back home. Somewhere in Kentucky we started to ask ourselves why not buy our car here and drive it home. Michael, thanks for all the interest and support. We hope to get to meet you someday. How far away are you from Lake Powell? No, we didn't dip our feet, but what the hey? we didn't dip our feet in the Pacific either (at least not in relation to this trip). Tiffany! it's great to hear from you! I hope you are enjoying Mississippi. Well, Belinda began talking about riding the Southern tier next, so maybe.. we'll come by someday. Stay tuned.. we will keep up the blog, the bike part is finished for now, but the adventure continues. Ray and Brenda, dear friends and road angels, lets be sure to meet up on our ways home! Ah, so this is it, eh? Well, godspeed back home with stories to tell and pictures to show!! Thanks Bill, you got us on our way, biking with us through California and Nevada. So many things really stand out; the school at Omo Ranch, Carson Pass in the blizzard, meeting John Blanco in Fallon, Middlegate, the hill at Austin, and of course the Electrolux Cafe. Just read your blog and, along with everyone else, want to congratulate you on reaching your destination. You truly lived your dream. Look forward to seeing you when you're back in California. Well here is yet another Congratulations on accomplishing your dream. The three of you are just amazing. So what color is the Prius? Let's make sure we stay in touch w/Mr. Blanco (you there, John?). Again, congrats a "tus para lo haciendo finalmente"!! Thanks Diana, thanks for sticking with us the whole way with your interest and support. We'll be home before you know it. See you then. Riesa, thanks. The color is a pale green as you will see soon if you continue to follow the blog. Bill, Mr. Blanco has finished his residency in New York and should be riding south along the Atlantic seacoast by now.